International travels can easily be illustrated with maps and other graphics. You can highlight relevant areas on the map and specific aspects of maps which can help make your points. 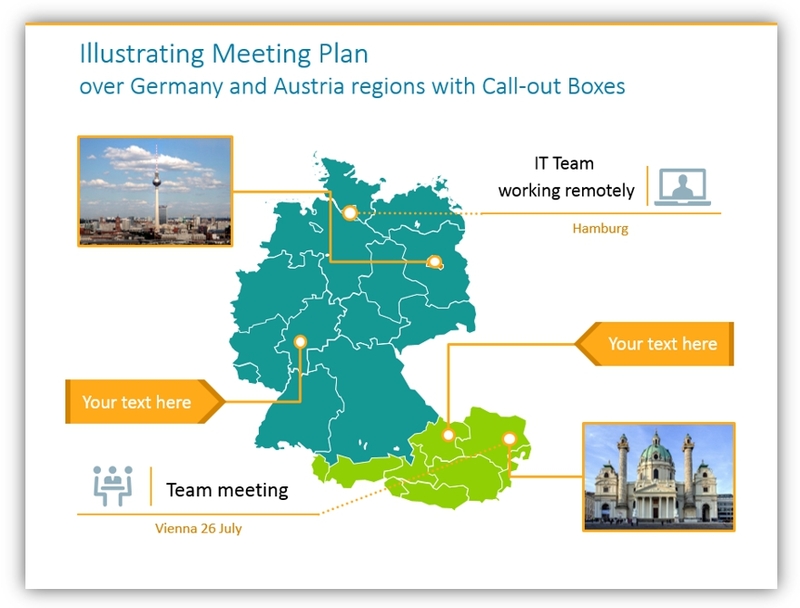 Maps in PowerPoint are useful for a variety of purposes. Whether you need to present a strategy for sales trips within your organization or explaining your overall sales strategy to your organization. Slides with maps allow you to explain your thoughts and plans with visual reference points. Maps are easy to edit and customize and can easily be embedded into presentations. 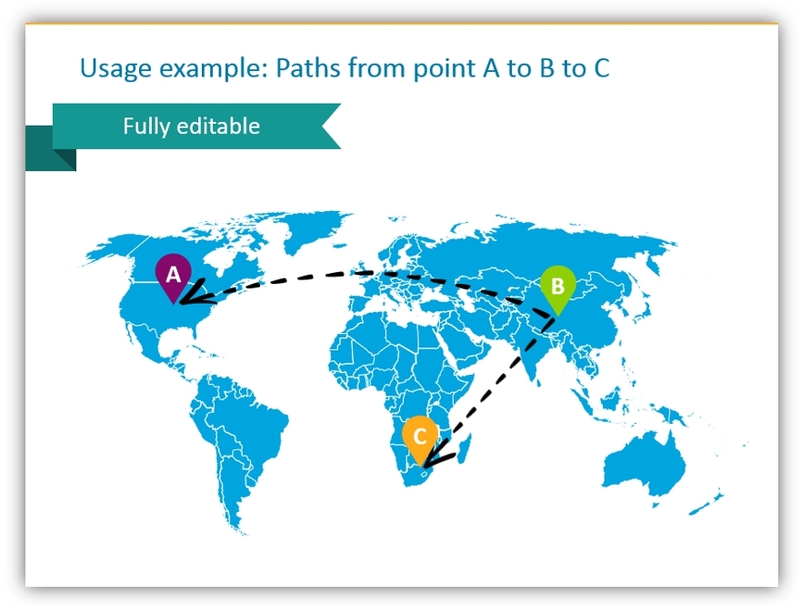 Such presentation maps do not require a network connection to be used as is the case of online maps. This is an asset for those who need to work on the go. Create presentation materials offline which don’t require an internet connection to display. Some teams like to use Google Maps and other tools for these purposes, but what they offer in detail they lack in convenience and customization. PowerPoint graphics, for instance, can easily have text notes added to help express your plans or any logistic information. AndAnother benefit is by having maps in slide format, it’s easier to print them. Graphics can also be used to make labels. 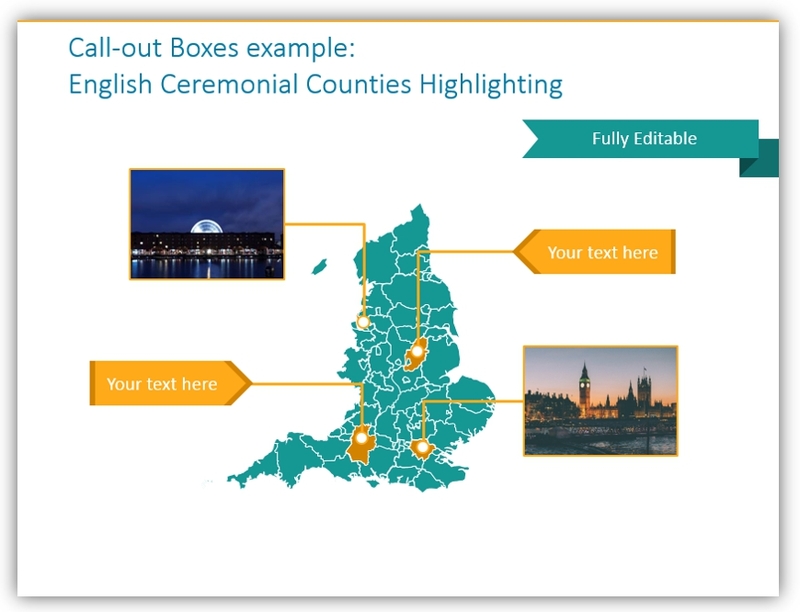 Call out boxes can function as labels for different venues, regions, and locations. You can also add additional details for accent different departments, teams, and projects. 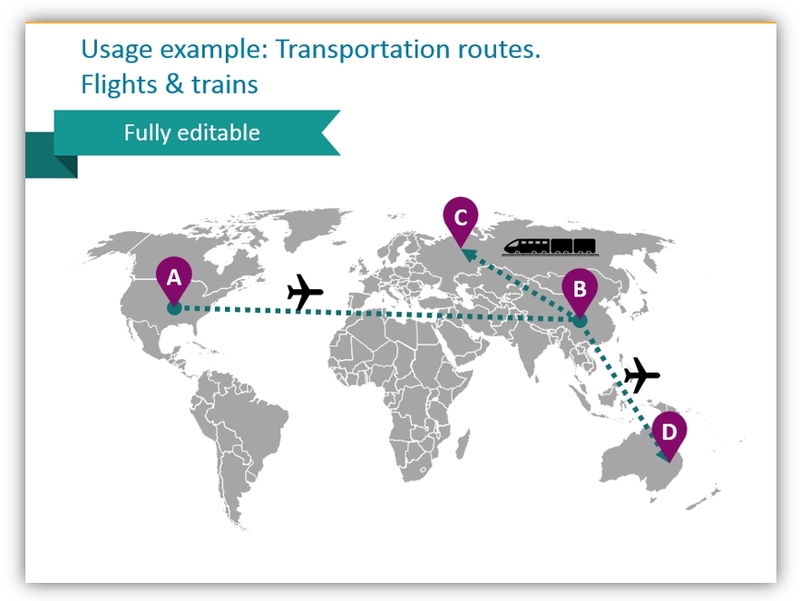 You can use maps to plot flights, train connections, and record the different types of meetings and destinations. When you’re working on a long trip with multiple methods of transportation you can clearly mark them. This can help make sense of lengthy trips. Especially when many modes of transportation are involved. There are a variety of graphics you can use and customize which highlight the transportation involved. If you’re using the map to show a delivery route or method of transporting products from a warehouse to a distribution center, you can show it with a truck icon. If your staff will be taking a flight for an annual company meeting, you can illustrate that with a plane. Preparing a meetings plan? It can benefit from maps as well. Are teams from different cities going to meet? Show their origins and the meeting place. Having a video call between offices or departments? Show the places where the teams are based and label the date and time of the conference call in a call-out box. You can also highlight the type of meeting which will occur if many meetings are scheduled for particular departments or divisions. Have many freelancers or staff who work from home? If they need to meet or collaborate, mark their locations on a map. You can vary colors, types of icons, or emblems to indicate their differing departments, functions, or even identities. How can you make maps work for you? Maps can visually express complex logistical plans. 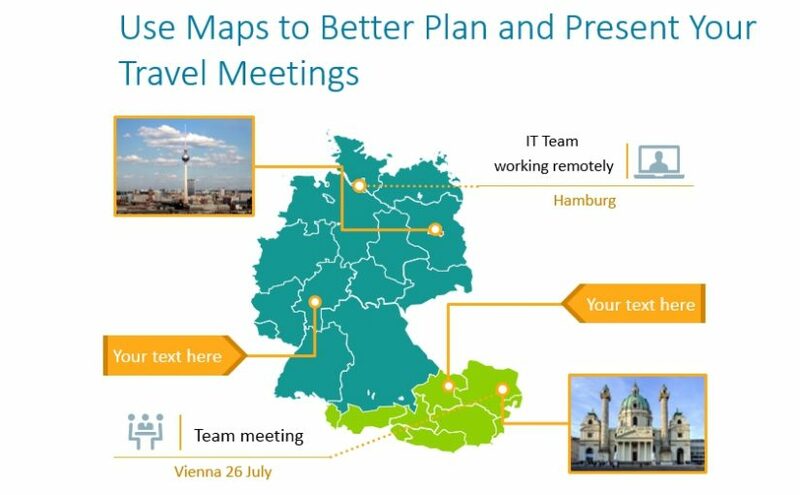 By using easily customizable maps and other graphics you can show travel plans to your teams. You can present your thoughts and plans for upcoming meetings with ease. 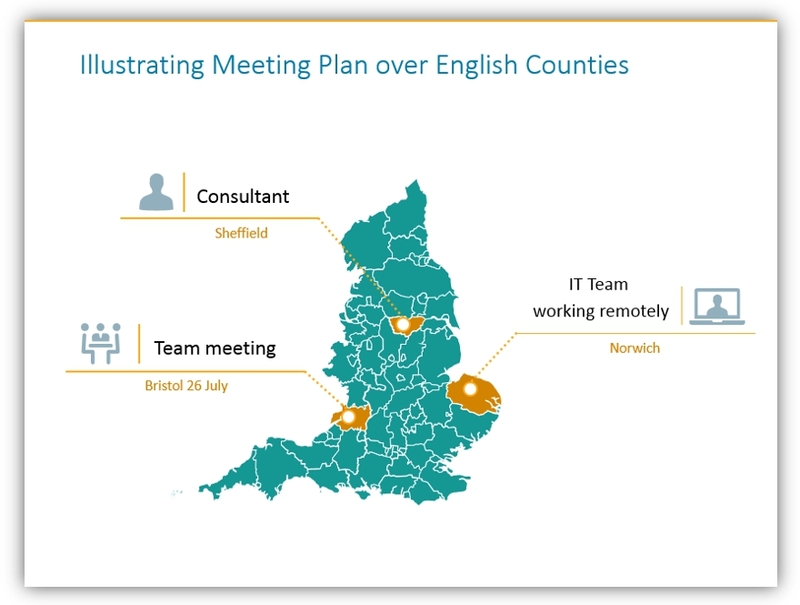 When you use PowerPoint graphics like these you get simple maps and graphics which can be re-sized, re-colored, labeled, and customized for your purposes. By making your own labels and call out boxes, the only limit to using map graphics in business presentations is your imagination. 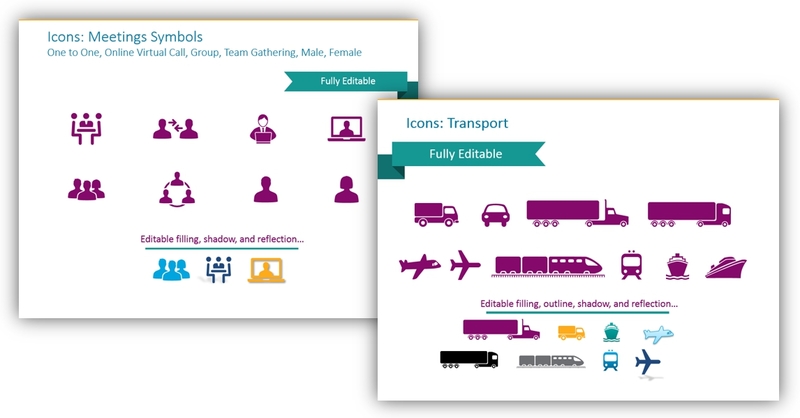 Since you don’t need a network connection to use these graphics or customize them, they are perfect for planning and presenting on the go. See the full set by clicking the button, and be sure to reach out to us if you need help deciding how to use them.